The significant events featured in this section acknowledge the long and rich history of Asian Canadians and their contributions to Canada. Canada’s cultural diversity strengthens the country socially, politically and economically in innumerable ways. 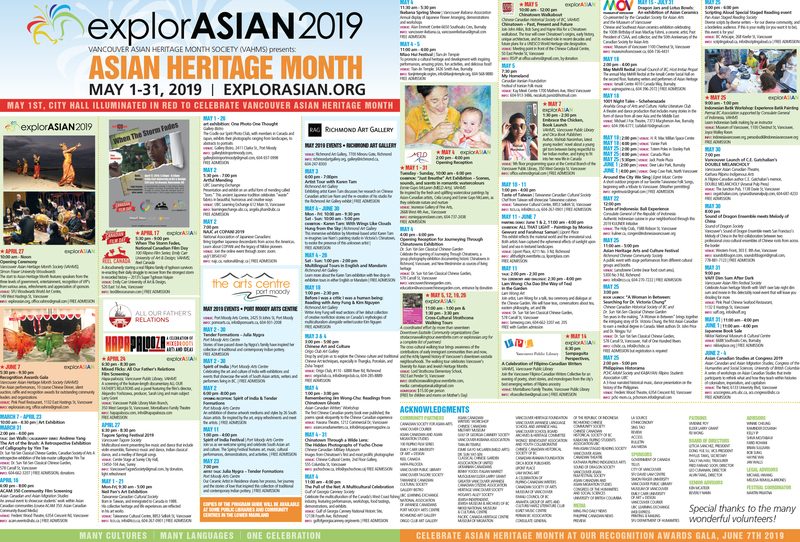 explorASIAN/Asian Heritage Month is an ideal occasion for all to celebrate the beauty and wisdom of various Asian cultures. Canadians are invited to take part in the festivities that commemorate the legacy of Asian Canadians and their many contributions which have helped Canada to become the multicultural and diverse nation it is today. This project is a special community building initiative of the Vancouver Asian Heritage Month Society. The intent is to broaden our understanding of Asian presence in North American history. It celebrates a legacy which began 450 years ago and continues today. The story is told through an abbreviated chronological timeline. This ground-breaking project is the first of its kind to unify the history of the Asian settlement throughout the entire continent including Mexico, United States and Canada. The focus is initially on greater North America and gradually narrows towards Canada and ultimately British Columbia. This project was researched and compiled by Jim Wong-Chu and Linda Tzang, with additional research and editing assistance from Charlie Cho. We would like to thank Sylvia Yu, Trev Sue-A-Quon, Jean Barman, Ted Koppel, Lei Baker, Loni Ding, Gordon Kwok, Dora Nipp, Grace Thomson, Reiko Tagami, Iqbal H. Ahmed, Harmohanjit Singh Pandher, Baltej Singh Dhillon, Sarg Jagpal, Amanda Boursicot, Larry Y. Wong, Lisa R. Mar, J.Lee, and Jerry Pickard for their generous advice and support. All rights reserved by authors. For information about permission to reproduce sections of this publication, please contact the Vancouver Asian Heritage Month Society. sailors and navigators on board Spanish galleons until 1815 when the last galleons docked. local Indians, one Filipino is killed. The galleon departs California on October 22, 1600. Point Reyes by the mouth of San Francisco Bay, California, on November 6, 1595.
to prevent Chino barbers from working in the capital. They are duly banished from the city. where the Manila Galleons landed, becomes known as the ciudad de los Chinos, the ‘City of Chinos’. ‘the road of the Spanish Chinos’ who later became known as Mexican Chinos. 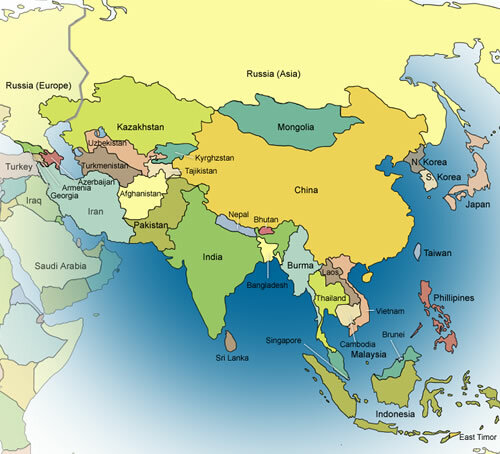 living colony of Asians in North America. where he lived until his death. He is buried in the Santa Barbara Mission Church. On August 9, 1785, the ship Pallas, skippered by John O’Donnell, arrives in Baltimore, Maryland. instance of Asians on the East Coast in the United States. John Meares’s ship, Nookta, along with other Asian sailors towards the coast of British Columbia. Islands, it is commanded by a crew of English and Chinese seamen. from China for the Pacific Northwest coast of America. sailors were commonly found in Acapulco as a result of the Manila-Acapulco Spanish galleon trade. Hawaiian grammar, dictionary, and spelling book, but he fell ill with typhus and died. abilities. A year later he recruits 26 more Hawaiian islanders to work for the company. he goes to California to join the Gold Rush. Kanaka labourers. By 1842, there are over 310 Kanakas on the Hudson’s Bay Company’s payroll. Fort Langley for the rest of his life. twin dies shortly afterwards. They are buried in the graveyard of the Baptist Church at White Plains. First recorded instance of Japanese shipwreck off the west coast of British Columbia. forts, farms and coastal ships of the Hudson’s Bay Company from California to Alaska. agent recruits missionary William R. Kaulehelehe, who became better known as Kanaka William. He arrives in June with his wife Mary S. Kaai and founds the Owhyhee Church. from Yale in 1876. He played an important role in building Sino-American relations. Northwest Coast. The initial work party consists of 35 French Canadians, Kanakas, and Englishmen. memory of one of the Kanakas, Joe Poalie, better known as ‘Joe Friday’. Victoria, B.C. She is the wife of the owner of the Kwong Lee Company. Guard but were combined to form a battalion and then put in a Regiment. “Colour Troops” divisions of both armies. November 11, 1864. He is reported to have Hawaiian blood. Columbia River. One of the most colourful Hawaiian traditions surviving in the Gulf Islands is the luau. shop, Japanese food store and hotel in Victoria. Chinese-owned laundries are established in Toronto. George Apnaut, a Hawaiian, is elected to one of the first Maple Ridge town councils. and the little riverside community was obliterated. The last house was gone by 1912.
than 4 for every mile of track. Chinese Canadian merchants establish the Chinese Consolidated Benevolent Association in Victoria. who had been expelled from Korea following an unsuccessful attempt to overthrow the government. such as Calgary, Toronto, and Montreal in search of job opportunities and less discrimination. largest Japanese Canadian settlement in Canada. Powell Street with her husband, Oya Washiji, a store proprietor. after and is buried in Beltsville, Maryland. rights. The first nissei (second generation Japanese person), Katsuji, is born to Yo and Washiji Oya. 3 weeks to protect Chinese Calgarians against further attacks. in both his homeland and the United States. Chinese Board of Trade is formed in Vancouver. operate the Sang Wo Bakery and Restaurant. She becomes the first Chinese woman in Alaska. and together they operate a gold mine, run a dairy and try their hand at trapping and prospecting. 1943, Mary becomes an American citizen. She died in 1958 and is simply remembered as “China Mary”. heads a fundraising tour to all the Chinese communities in B.C. before embarking on a U.S. tour. in 1919. He is arrested by the Japanese in 1935 and dies shortly afterwards. Filipino cannery workers, calling themselves “Alaskeros,” begin to live permanently in Alaska. and oyster cultivator only to lose everything when he and his family are interned during World War II. of his grandchildren in Japan. Still hanging proudly on the wall was his law degree. in the U.S. consisted entirely of exiled intellectuals. of about 80 Filipinos. The project is completed a year later. Five thousand Indian men (almost all Sikhs) begin to arrive in BC, most find work in lumber mills. New Westminster where he dies in 1948.
entire Indian community and a focus for religious, social and political activity. which soon began publishing the first Korean-language newspaper. business losses, $9,000 is awarded to the Japanese. A violent mob of Euro-Americans drives 400 Sikh workers out of Bellingham. tries to remove Sikh Canadians by offering them land in British Honduras. The Sikhs refuse. in Vancouver’s west end. This serves as a gathering place for Indians of all faiths. Professor Teja Singh establishes the Guru Nanak Mining and Trust Company. This provides an economic foundation for the Sikh community in Canada. The United States Department of Agriculture awards its highest honor, the Wilder Medal to Lue Gim Gong. longer bears his name. Lue Gim Gong lived in obscurity and poverty, and died alone. His grave is untended. to assist the workers. Korean association leaders, however, are indignant and refuse Japanese assistance. The first Sikh baby born in Canada, Hardial Singh Atwal, is delivered in Vancouver. Hardial is the son of Balwant Singh Atwal, the first priest of the 2nd Avenue gurdwara. Hawaii pay tribute to his worldwide influence on surfing. Three hundred seventy-six Indian immigrants arrive in Vancouver harbour on the steamer Komagata Maru. naval cruiser HMCS Rainbow escorts the vessel out of Canadian waters. on Powell street, they compete at all levels with teams from throughout the city and toured Japan until 1941.
he was praised by his peers but roles were limited due to his ethnicity. Racism led him to leave the U.S.
to resume his movie career, this time as a character actor, mostly in war films about World War II. in David Lean’s The Bridge On the River Kwai for which he was nominated for an Academy Award. that up to 300 Chinese Canadians volunteered to serve in World War I.
Uchida Chitose is the first Japanese Canadian to graduate from a Canadian University. She would later became a school teacher. Canadian Indians”. By 1925, close to 1,000 licenses are stripped from Japanese Canadians. controls 80% of California’s potato market. Chinese students to return to the public school system. which she flatly refused. She made a handful of films in the 1940s but turned to television in the ’50s. Filipino American boxer Francisco Guilledo becomes the World Flyweight Champion. after winning 103 victories out of 108 fights. Anti-Filipino riot erupts in Watsonville, California and in Kent, Washington. A delegation from the Japanese Canadian Citizen’s League goes to Ottawa to plead for the right to vote. attractions and for most non-Chinese it is their first introduction to the Chinese community in their city. Jack Shirai, a New York restaurant worker, is killed fighting the fascists in Spain. He was the only Japanese American in the Abraham Lincoln Brigade. a ceremony to commemorate the event was conducted at Yad Vashem, the Holocaust Memorial in Jerusalem. Chinese Canadians volunteer for military service in World War II. The Canadian government refuses to consider them for active combat service. Chinese Canadians are classified as ‘allied aliens’ and subject to investigation. Despite citizenship, Japanese Canadians are excluded from military service. All Japanese Canadians are required to report and register with the Register of Enemy Aliens. Sandon and Tashme) in the British Columbia interior. A small number of Chinese Canadian volunteers with special skills were allowed into active service. to work behind enemy lines in Asia. Chinese Canadians were not generally called into the draft until 1944.
he is also among the first to liberate the POW’s held by the Japanese at the Sham Shui Po prison camp. into moving to Eastern Canada or be deported to Japan. by Tommy Douglas, future leader of the federal New Democratic Party. the highest military honour given by the British government to non-British citizens. and tennis coach. In 1972, Kwong returned to Canada and is now the President of Food Vale in Calgary. and Frank Sinatra, she hosted a 1/2 hour Saturday afternoon program called Jennie’s Juke Joint on CKMO. Olympic history to win the Gold Medal in high (platform) and low (springboard) diving. Japanese American Harold Sakata, a native Hawaiian, won the Silver Medal in weightlifting. person to exercise the franchise between the exclusion periods. originally imposed on Japanese Canadians during World War II. operations, and was a vocal critic of cutting practices and forest management systems in his day. 10 years 3 or 4 giant corporations would effectively control the industry in B.C. diver to win back-to-back gold medals. His second Gold Medal for men’s high diving came on his 32nd birthday. became the first Japanese Americans to win Gold Medals in swimming. Dahlip Singh Saund becomes the first Asian Indian American elected to the U.S. Congress. Margaret Jean Gee becomes the first Chinese Canadian woman lawyer admitted to the bar in Canada. B.C. Law Society lifted its restriction on bar membership to only those who were eligible to vote. She also was the first Chinese Canadian woman Pilot Officer (Reserves) in the Royal Canadian Air Force. awarded the Eddie James Memorial Trophy as WFC’s leading rusher three times and was a five-time All-Star. (the third highest in league history). He is a member of the Canadian Football Hall of Fame. Douglas Jung, representing Vancouver Centre, becomes the first Chinese Canadian Member of Parliament. Chinese Americans, Chen Ning Yang and Tsung Dao Lee win the Nobel Prize in Physics. Wayson Choy’s first published work is selected for The Best American Short Stories. Enzyme Institute at the University of Wisconsin, eventually becoming its Co-Director. Promod Puri launches the Indo-Canadian Link newspaper in Vancouver. martial arts philosophy, jeet kune do. for the Canadian Armed Forces. The government had to design a special uniform for her. with the Powell Street Festival. names such as Roland Road and Kanaka Road, and the Kanaka Restaurant in Ganges. Ellison Onizuka, a Japanese American aerospace engineer, becomes an astronaut candidate. leads to the creation of the Chinese Canadian National Council. of a young girl, the novel significantly raises awareness of the Japanese Canadian internment experience. for his theoretical studies of the physical processes related to the structure and evolution of the stars. Observatory in his honor and launched by the space shuttle, Columbia. is presented to the government. Mr. Justice Wallace (Wally) Oppal, an Indo-Canadian, is appointed to the BC Supreme Court. Monmohan (Moe) Sihota becomes the first Indo-Canadian Member of the Legislative Assembly. incarceration, seizure of property and the disenfranchisement of thousands of Japanese Canadians. Lieutenant Governor of a Canadian province. Jan Wong begins her six-year stint as the Globe and Mail’s China correspondent. professional tennis players in the world. RCMP officer to wear a turban and other Sikh symbols. are the first Indo-Canadians elected to Parliament. Mahli is the first turbaned Sikh to do so. Minister of National Revenue in 1997. Since 1999, Dhaliwal has been the Minister of Fish and Oceans. Vancouver, British Columbia on October 16, 1974 to a Japanese-Canadian father and a caucasian mother. All American Girl. The show aired for two seasons on ABC. the Kanakas on Saltspring and the Gulf Islands was dedicated. wins the Best First Film prize at the Berlin International Film Festival. Rohinton Mistry: wins the Giller Prize (Canada’s richest literary award) for his novel A Fine Balance. for the prestigious Booker Prize. Tiger Woods becomes the youngest man ever to win the Masters Tournament at Augusta National Golf Club. the U.S. Open and the Masters) in one tournament year. Vivienne Poy, entrepreneur and philanthropist, is appointed to the Senate by Prime Minister Jean Chretiene. She is the first Chinese Canadian to serve in this capacity. Kwan was the youngest person ever to be elected to Vancouver City Council. prestigious Julliard School of Music in New York City. Journalist and broadcaster Adrienne Clarkson, becomes the first Chinese Canadian Governor-General. Ujjal Dosanjh, the first Indo-Canadian to serve as provincial Attorney General, is sworn in as B.C.’s 33rd Premier. in their new facility in Nikkei Place, Burnaby, BC. when he is appointed Secretary of State for the Asia-Pacific region. Emmanuel Sandhu becomes the first Indo-Canadian to win a Canadian Figure Skating Championship. Ang Lee is nominated for 10 Academy Awards, including Best Picture, Best Director and Best Foreign Film. and Golden Globe nominations for his first film, The Wedding Banquet.